I hope that everyone enjoyed our Day 1 travel log, without further ado, here is Day 2. Slammed from our 30 hour stretch without sleep, our entire party slept like rocks Thursday night and nearly missed our morning train to Edinburgh on Friday. Fortunately, we recovered and swept out of our hotel in time (well, sort of) to make it to BT Murrayfield. 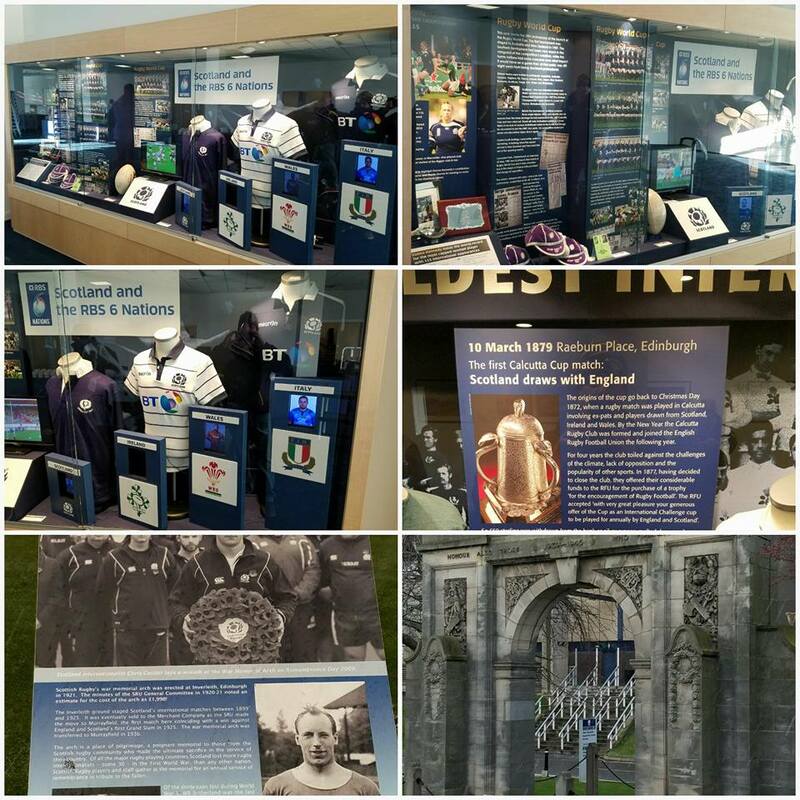 We were originally scheduled for a full tour and then a meeting with Scottish Rugby Union staff. Due to our late start we opted to hold our meeting first and then head into the tour. We were met outside of the stadium by Neil Graham, Coaching Development Manager for the SRU. He led us upstairs to their offices at BT Murrayfield. We were joined shortly after by SRU Head of Club Services Nick Rennie. Our conversation with Neil and Nick went well past our original time allotment and it was more than worth it. As development (player, coach, ref, volunteer) has a massive impact on overall satisfaction for everyone involved in rugby, we tried to sham-wow everything that Neil gave us. 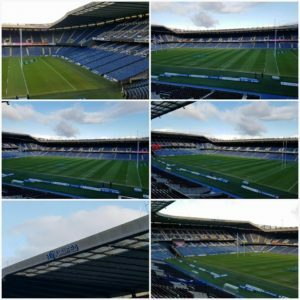 At the same time, it was hard not to sit back and get caught up in the fact that we were sitting in one of the most famous rugby stadiums in the world. On top of that, we were given access to people and information that was well beyond anything we have in the USA. It was quite surreal. The SRU has placed a heavy focus on skill development, enjoyment, and safety at the youngest age groups. Tactics don’t start to come into play until middle school. Something that we see stressed all too early in youth rugby in the USA. Not enough time is being spent with ball in hand in the USA which then shows later in the player’s development cycle. Developing their coaches is also a high priority. Better coaches make better and happier players. They have some wonderful coaching resources that are accessible online and a heavy continuing education schedule. Nick followed with an overview of club rugby and a great discussion on some of the struggles that they face at the club level in Scotland. Admin is in my wheelhouse, so digging into these sustainability issues and relating them to what we experience in the USA was amazing for me personally. The SRU has some really interesting initiatives in the planning stages. Some of them are things that I’ve heard about for years coming from USA Rugby, but have still yet to see. The duo left us with a heap of literature and resources (as well as more in my email inbox when we arrived home). Well more than we ever expected. We were incredibly excited when we were told that we could meet with them shortly. When that meeting sped well past an hour we were over the moon. Again… guys from a newer club in North Carolina sitting in a world renowned stadium gaining knowledge from union leadership. We would have been happy with the tour, but as with everything and everyone on this trip, they redefined the term hospitality. As our meeting ran long, Neil opted to give us a personal tour of BT Murrayfield. So, instead of what you get with a standard tour, we got all of the good stuff and none of the fluff. First thought in stepping out into the stadium is that TV does not do it justice. There is not a bad seat in the entire stadium. All 60,000 plus of those seats. Neil took us down into some of the hospitality areas and then into the lower levels of the stadium. The place oozes history with memorabilia around every corner. Then came the best parts. 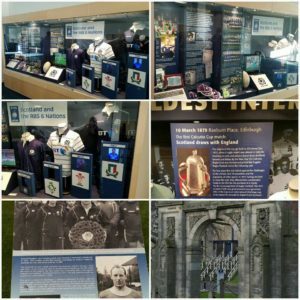 We got into the Scotland changing rooms for a look around and then out the tunnel and onto the ground level at Murrayfield. Real goosebump type stuff. The surface is a hybrid that has artificial grass and real grass woven together. The grounds crew were out working on it so we couldn’t go running around on it. Although that was the only thing going through my head at the time. Before departing the stadium, Neil led us to the team shop and our group went crazy in there like a bunch of women on a shopping trip. Seriously… how many times do you get to go to a huge store that is wall to wall rugby stuff? In the USA, the answer is never. So, we took advantage to the chagrin of our bank accounts. Loaded up with some fresh Warriors and Scotland swag, we trudged back to the train station bags in hand. The sunshine that broke through while we were on the pitch at Murrayfield turned to sleet and then snow while we walked to the station. It is Scotland right? Can’t go there and not experience some of the weather extremes. We made our train on time and headed back to Glasgow to get ready for the Warriors match against Scarlets. After quick showers we returned to Scotstoun to meet our liaison Madeline. She guided us to their community fields which are adjacent to the stadium. 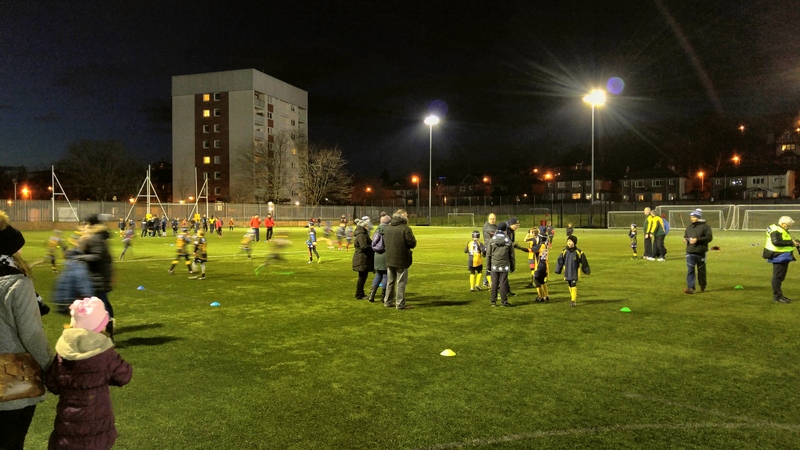 Before everyone Warrior’s home match, youth teams from the community have a jamboree on the community fields. It was really fun to watch as the teams seemed to be made up of U8s and U10s. Much to our relief, youth rugby in Scotland in those age groups looks exactly like youth rugby in the USA. 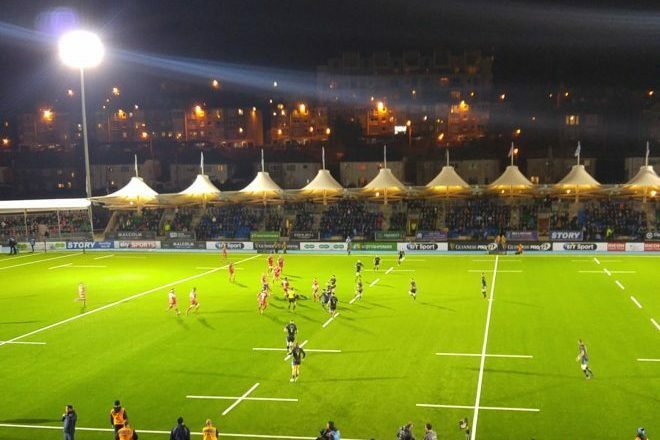 The jamboree right there at Scotstoun could have been in Clayton and we wouldn’t have known the difference. The differences start to show around middle school, where the handling skills and decision making are leaps ahead of what I’ve seen in the USA. While the youth matches continued on we made our way over to the gathering space for the Warrior’s Supporters Club, called the XVIth Warrior. We met the President of the club as well as a number of members. 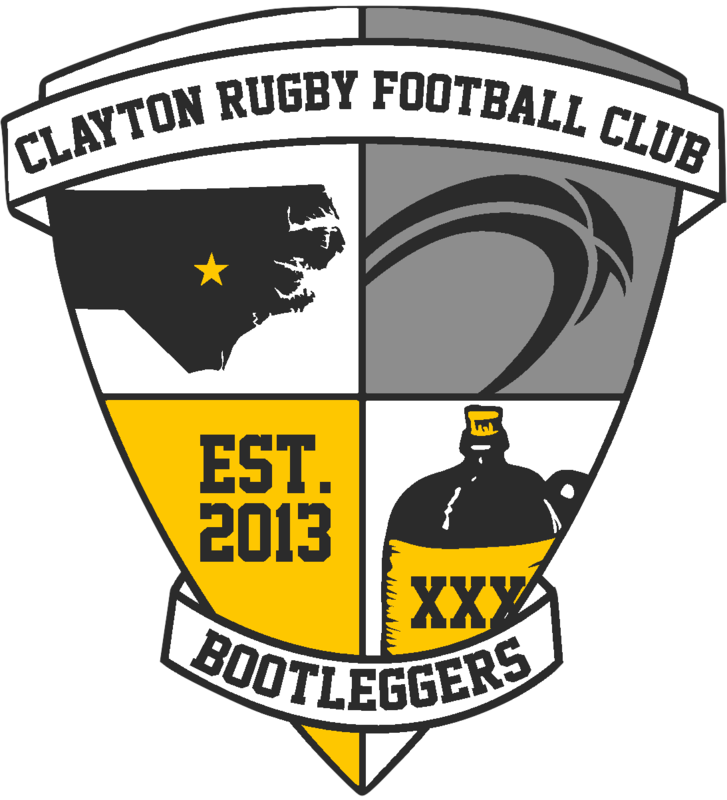 The conversations inevitably led to talk of the state of rugby in the USA. As with everyone else, they were keenly aware that rugby is growing in the USA and are keeping an eye on our development. With the match about to start, the Supporter’s Club was about to close doors. We thanked our hosts again and made our way back inside of the stadium. We had been given access to the Business Club which was a nice place to go to warm up and get a drink before the opening kickoff. We had excellent seats for the match. Right on the 50 just in front of the box where the coaches sit. Excellent seats. The sold out stadium buzzed with excitement for the start of the match. Even with 14 players away on Scotland duties, the Warriors still have plenty of quality players and came out firing against the Scarlets. After taking an early lead, the Scarlets worked their way into a stranglehold on the match with some hard work at the breakdown. The theme continued into the second half as Scarlets dug in and slowly extended their lead. Even with that, the Warriors were within reach until the final minutes of the match, but just couldn’t finish. Final score Scarlets 26 Warriors 14. It was disappointing not to get to see a Glasgow win, but that didn’t dampen our spirits too much. Following the match we headed to Harper Macleod Club Deck which is the major hospitality area for the club. While up there we met back up with Nathan and he introduced us to a number of people while we enjoyed our surroundings and company. Players began to filter into the Club Deck and mingle with the fans. Former Warriors and Scotland Captain Al Kellock came over and spent some time with us. Now a Rugby Ambassador for the Scottish Rugby Union, Kellock was gracious with his time and there was little doubt why he is now an ambassador for the sport. We closed down the Club Deck and then headed out for some much needed down time. Food too… just saying that Fish and Chips after a long day and night is about the best food I could imagine. That or we were all so hungry that it tasted like an aged steak. Either way, it felt good in our bellies. So good we went back the next night for more. Then it was off to bed to prepare for another great (and busy) day. Day 2 in the books. We’ll probably combine Days 3 and 4 in one final post tomorrow. Thanks for reading.